Even though hurricane season has already started, it is not too late to install hurricane shutters to protect your Jacksonville home. These storms can cause severe damage to both the inside and the outside of houses. With durable, weather-rated blinds, damage can be prevented. This type of weather is very dangerous, especially for coastal towns like Jacksonville. The high winds caused by tropical storms can destroy entire buildings. These winds start at a force of 74 miles per hour and can reach over 156 miles per hour. Because these winds are so strong, they are able to pick up objects like roofing materials and other untethered items. Without hurricane shutters, these items can be propelled into your house and cause damage to your home. It is important to be aware of the dangers of severe weather, and what you can do to keep yourself and your family safe. Installing hurricane shutters is one of many ways to keep your home protected. Often, people spend lots of time and effort boarding up windows in Jacksonville. When sturdy materials like plywood run out, many people try to use drywall and tape to keep their windows safe. With hurricane shutters, there is no need to purchase plywood or hope that tape will be strong enough. Before the season even starts, you will have the ultimate safeguard for your home. These are a long-term solution to the high winds of a severe tropical storm. These blinds stay up year-round and provide privacy and shade during the off-season. When severe weather hits, it is easy to pull these blinds shut and secure them. While a piece of plywood would cost less money up front, the cost of damages to your home and yourself would far surpass the cost of permanent protection. Two of the most popular types of hurricane shutters are Bahama and Colonial. Bahama-style offers a more tropical look. They are perfect for buildings in a coastal town like Jacksonville. These louvers mount outside of your windows and hinge at the top. They are very easy to open by yourself and close quickly in the case of a tropical storm. In addition to protection, they provide shading and privacy. Colonial blinds offer the same protection, shade, and privacy as Bahama-style. However, they have a different appearance. Colonials have a classic style. They are often featured on plantation-style homes. Like the Bahama, this style also attaches to the outside of your window. They mount to the sides of window frames and open outwards. When you want privacy or protection, these blinds close quickly and easily. While many materials are available for both Bahama and Colonial style blinds, Master Aluminum sticks with the protection and durability of aluminum. At Master Aluminum, many different colors are available to match these louvers with your home. From standard colors like oyster white and water blue to custom shades like traffic purple and luminous yellow, your blinds will complement your house and provide safety at the same time. Master Aluminum provides Jacksonville with hurricane shutters that can handle severe winds. 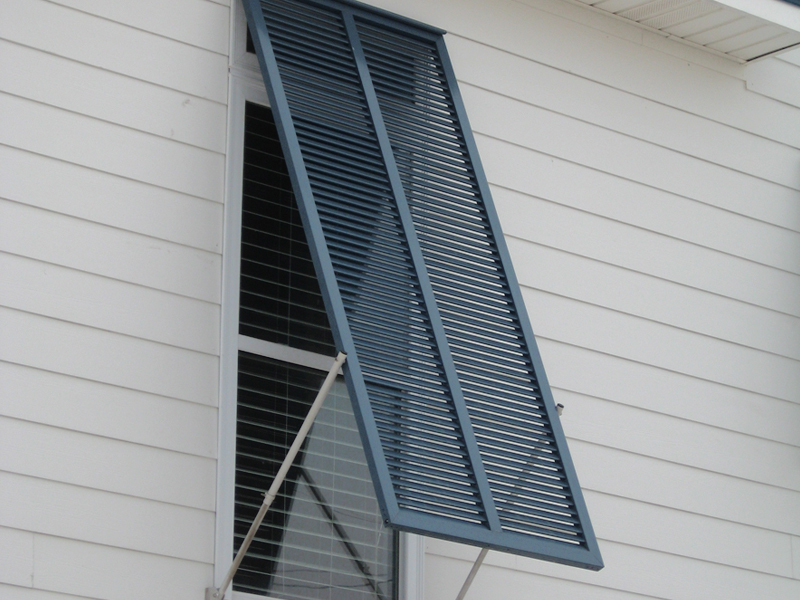 Our hurricane-rated shutters are welded to maximize strength. The blades are welded to the back of the frame to ensure that high winds do not cause the frame to bow. To finish the blinds, we apply a powder coating with a super durable polyester powder. This coating provides even more durability and resistance. To guarantee customer satisfaction, Master Aluminum offers product warranties of three, five, or seven years. We are also enrolled in a quality assurance program. For more information, contact us online or call at (727) 725-1744.